Do you need a new garage or more storage space? Here are dozens of free building plans for one, two, three and four-car garages, carports, carriage houses, combination garage workshops and country-style car barns with storage lofts. 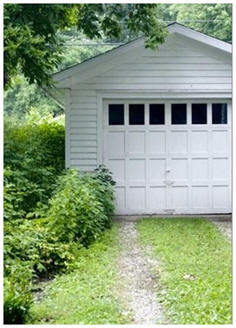 Get free instant download plans for one and two car garages. These buildings all have storage lofts and can be built with a variety of exterior materials. The fast, easy and accurate instant-download plans will help you envision, price and build the perfect project for your home and property. 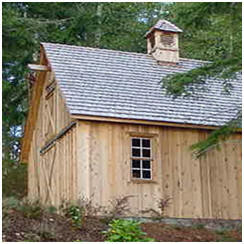 This beautiful design, from BarnToolBox.com features economical pole-barn style construction. 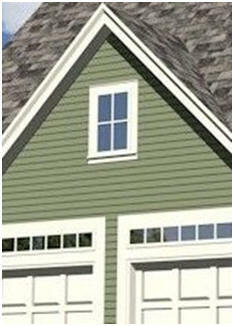 This well designed 2-car garage is packed with many features and options. The steep roof permits an optional loft with over 5' walls on the second floor. Loft access is from an L-shaped stairway on the right wall. On the main floor a 3' personal door and 6' window on the right side help add natural light. These five old garages are samples of the hundreds of designs that have been preserved through the HABS. You can view and print photos and measured drawings of floor plans, exterior elevations and construction details. This 24' wide by 22' deep garage will fit two cars or small trucks with plenty of room left over for yard tools, bikes and such. There's a loft with pull-down stairs for extra storage space. The drawings are designed for inexpensive but sturdy post-frame (pole-barn) construction, by architect Don Berg. 19th century carriage sheds were used at churches, inns and other public buildings to shelter carriages, wagons and horse teams. They were the precursors of today's multi-car garages and are good prototypes for modern garages that complement traditional homes. Get downloadable plans for a 12'x24' one-car garage. This garage uses 2x4 studs and rafters, and has concrete footings and optional windows and a concrete floor. Shelter your car or tractor or create storage space with the help of any of these free building plans. Print free design plans and building details for one and two car garages and combination garage/workshops. Get started on your new garage, shed, cabana, barn, car barn, hobby shop, carriage house, workshop or backyard studio right now. With one order for just $29.00 you can download professional construction blueprints for over one hundred different designs. You'll be able to download any and all of the plans right away and print as many copies as you need to get permits, to get contractors' bids and for construction. The set comes with a full money-back guarantee. Use a 10'x24' lean-to roof against your garage or house as your carport. 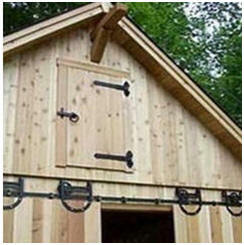 The simple construction plans from BarnToolBox.com are for practical post-frame construction. A carport, or covered shelter or lean-to shed, attached to an existing building can provide economical storage for vehicles, garden tractors, boats or other equipment. It can be fairly easy to construct. This step-by-step building guide by Monte Burch of Extreme How-To Magazine will show you how. This beautiful and practical pole-frame structure, by Chandler Design/Build, has parking for two vehicles under a wide hip roof. A 12'x20' enclosed project room opens from the carport. It's perfect for use as a workshop or storage room. Find Lean-to carports for the side of your garage or home and one and two-car, free-standing carport designs. There are even carports that are big enough for your camper, tractor or RV. Online plans include diagrams, step-by-step instructions and building hints. Park your cars in style. These elegant coach-house style two, three and four-car garages are perfect for older neighborhoods and old or traditional homes. They all have big lofts that you can use for extra storage or finish as an office, studio, guest bedroom or kid's play room. Get inspiration from classic carriage houses from America's past. These ten different nineteenth and early twentieth century carriage houses and stables are samples of the hundreds of barn, garage and outbuilding designs that have been preserved through the HABS. Build garages, barns, small and simple homes, cabins, cottages, stables, sheds and more with the help of professional blueprints, building kits, manufactured buildings, do-it-yourself project plans, construction products, tools and good advice. Click to read more about hundreds of great designs. These five free building plans can help you plan, price and build a vehicle barn, country garage or combination car barn and workshop for your country property. Shelter your cars, trucks, tractors, SUVs, boats and recreation vehicles, or have a great workshop with the help of these blueprints. 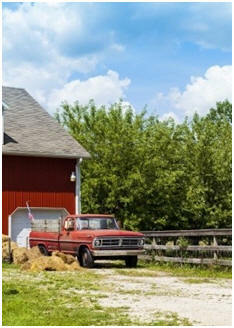 You can park a car, tractor or small truck in this little barn and still have more storage or workshop space. Post-frame or "pole-barn" construction makes for a sturdy but inexpensive little building. Use the convenient loft for even more storage. Free plans are offered by architect Don Berg and this web site. Use this small, all-purpose pole-frame building as your garage, workshop, hobby shop or tractor shelter. It has parking spots for two cars, trucks or boats, an extra area for a workshop and tools, and a storage loft with pull-down stairs and a convenient outside door and lift post. A quick video lets you take a spin around the building to see how it looks from all angles. Family Handyman Magazine calls this 2011 design a Garden Shed. It can be that, but it's also big enough and bright enough to be a backyard studio, workshop, home office or hobby shop. The downloadable plans and material list are for experienced builders. Family Handyman Magazine calls this 2010 design an Ultimate Shed. It is that, but it's also big enough to be your woodwork shop, studio or hobby shop. The high and wide front door allows easy access for big projects The downloadable plans and material list are best for use by experienced builders. Create the perfect woodwork shop, hobby shop, crafts barn, home office or studio with the help of these free blueprints. Enjoy automobile or old tractor restoration projects or create big pieces of furniture. These designs all have full vehicle doors for easy access and lofts for extra storage. These seven work buildings, which span three centuries, are samples of the hundreds of designs that have been preserved through the HABS. You can view and print photos and measured drawings of floor plans, exterior elevations and construction details. Check out our list of some of the best free blueprints to help you build a new storage barn, tractor shelter, chicken coop, horse barn, smoke house or just about any type of country outbuilding. You'll find dozens of great designs. Build the storage units, work benches, lumber racks, power tool stands and jigs that you'll need in your new woodshop or wood shop. Check out our list of hundreds of free, do it yourself project plans. Here's an architect-selected list of the Internet's top designs, absolutely free plans and how-to-build lessons. Find and build your own perfect storage shed, tool shed, mini-barn, space saving lean-to shed, storage bin or outdoor closet. 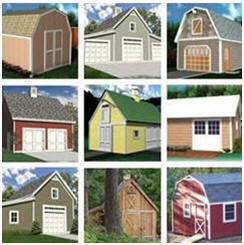 Find plans to help you build the perfect small wood shop, cabana, pool house, art studio, craft barn or backyard office. Learn how to build all types of garages and workshops with the help of these illustrated, step-by-step lessons. Turn any building plan into a do-it-yourself project, save construction costs by finding out which parts of the project you can handle yourself, or learn enough to understand and follow your contractors' progress. Help yourself to hundreds of plans for sheds, barns, cabins, cottages, solar homes and backyard structures, offered for free by some of the Internet's top designers and publishers. Then, check out our lists of thousands of free, do it yourself woodwork, home improvement and backyard project plans too. Build the perfect little barn for your property. Find construction blueprints for small pole barns, barn-style sheds, little pole-frame garages, all-purpose yard barns with lofts, small storage barns and little pole-frame country garages.